Lori from Turner’s Outdoorsman with a nice looking yellowtail. First-timer Mike G. with his first tuna! Manny with his 166# tuna! Norm C. with his 84 pound yellowfin. Norm is a member of the San Diego Anglers. 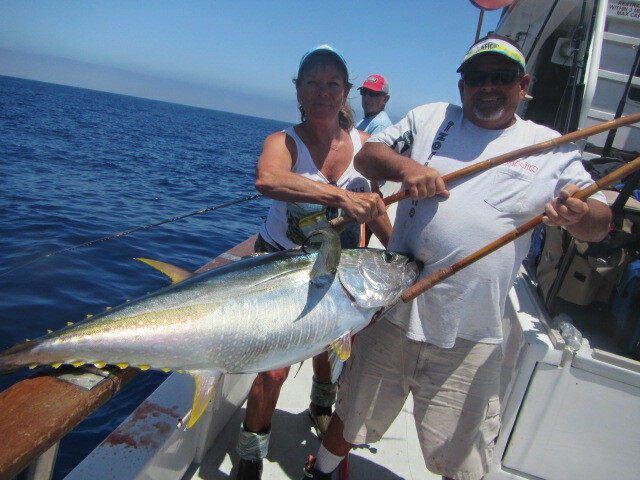 Michelle M. and Capt Art with her 50 pound yellowfin. Teresa R. and a nice tune she caught! Lori and Capt Shawn. with a tuna. Lori reeling in a tuna!